The Pinotage Club: Pinotage - "It's a South African Variety"
Pinotage - "It's a South African Variety"
It is time we stopped automatically referring to the parentage of Pinotage. I recently spent some time listening in at various Cape tasting rooms and the usual mantra when pouring Pinotage is “This is Pinotage – it is a cross of Pinot Noir and Cinsaut,” and sometimes the the Hermitage – Cinsaut connection is thrown in to explain the name. 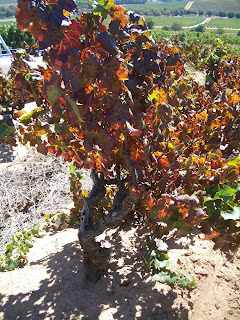 The excuse is that Pinotage is a new variety to many people. But those same people had to taste Cabernet Sauvignon and Shiraz for the first time in the past and it is certain that the pourer just announced the variety without mentioning that they are crosses* and telling them the names of the parent vines. What we are doing is confusing a great many people without enlightening them. How many casual wine drinkers even understand what a ‘cross’ means? A look around the internet quickly demonstates how many visitors to Cape wine lands have departed with the idea that Pinotage is a blend or mix of wines. Some winemakers like to say their Pinotage shows some Pinot Noir or Cinsaut characteristics – but is that what the tasting room visitor ought to be looking for? Shouldn’t they be experiencing a new variety and enjoying it for its own flavours, not feeling bad because they can’t taste the Pinot Noir – and how many of us know what Cinsaut tastes like? I’d like to see Pinotage being introduced as a South African variety – and leave it at that. Of course, if there are questions about its antecedents they should be answered. But let’s not throw all that confusing baggage at new drinkers. So, lets say 'It's Pinotage -- it's a South African variety'. * Cabernet Sauvignon is a cross of Cabernet Franc and Sauvignon Blanc, and Syrah/Shiraz is a cross of Dureza and Mondeuse Blanche. When was the last time you heard a winemaker saying their Cabernet Sauvignon was showing its Sauvignon Blanc characteristics? I completely agree! I think many South African wineries keep bringing up Pinotage's heritage as a means to get tourists interested and have them try it - since Pinot Noir is so popular nowadays. That said, I think most people will try it anyway, just knowing it's a South African grape variety. Matching Food & Pinotage – Salmon or Lamb?